Animals are a frequent subject for Creator sets and many previous models have been excellent. 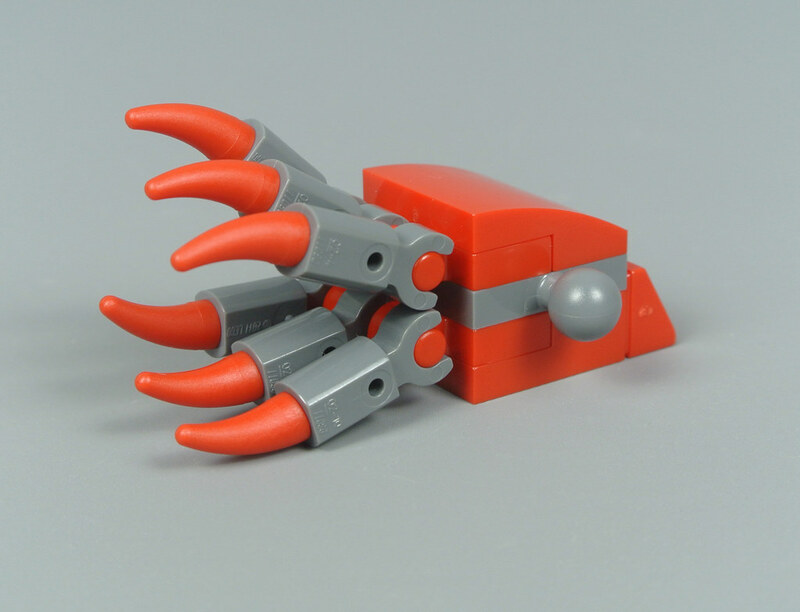 In fact, 31088 Deep Sea Creatures bears a close resemblance to the exceptional 4506 Deep Sea Predators from 2004, displaying a shark beside an anglerfish and a squid on its packaging! My expectations for this set are therefore very high and I think the primary model looks marvellous. Furthermore, it contains 230 pieces but only costs £12.99 or $14.99 so appears to offer great value, particularly given the consistently impressive standard of the alternative models which are all examined in this review. 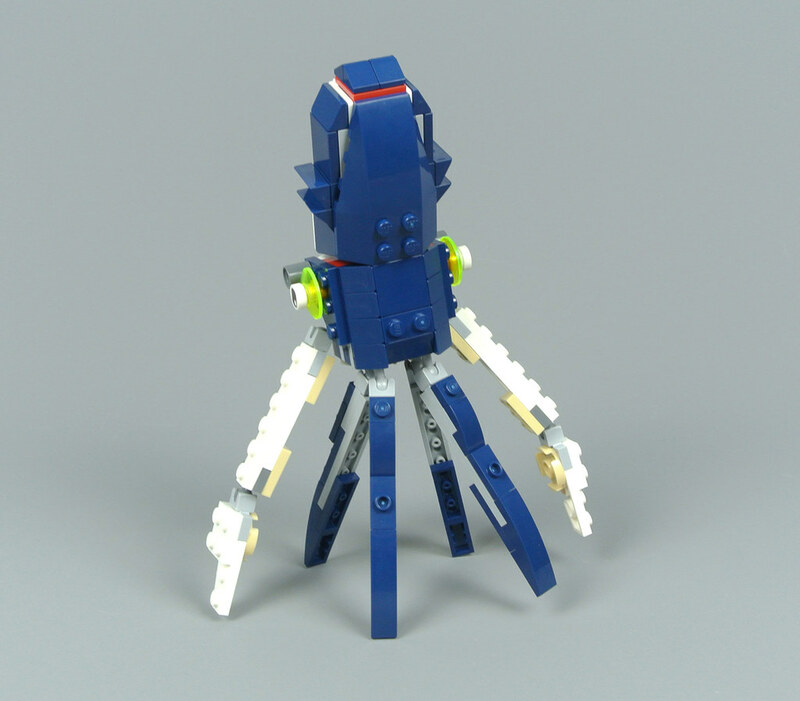 Squid have appeared in numerous LEGO sets and their scale has remained relatively consistent. This animal occupies about half of the pieces included and measures 18cm in length when its tentacles are fully extended. The proportions between those tentacles, the head and the distinctive mantle are fairly realistic and I appreciate the balanced combination of dark blue and white pieces. Displaying underwater creatures is often challenging and this squid is no exception as its arms appear more impressive when spread. On that basis, you can display the model as though it is standing on its tentacles as they are individually articulated so provide some support, although an additional ball joint on each dark blue limb would have been useful. The majority of squid have more than six limbs but I like the white feeding tentacles which are slightly longer than the other arms, loosely corresponding with those found on the real animal. The tan barbs on these tentacles look superb but the mouth between them could be improved. It is currently hidden behind the four smaller tentacles rather than being absolutely central which is disappointing. Fortunately, the head appears more attractive, featuring some interesting texture along with two trans-neon green eyes. The angled connection between the head and the mantle looks realistic and the red highlights are a lovely detail. In addition, two dark bluish grey 1L Technic connectors are placed below the eyes. I think they are intended to represent the funnel, through which a squid expels water from its mantle cavity to aid in propulsion. The second manual contains instructions for an anglerfish along with an accompany minnow, both of which look superb. 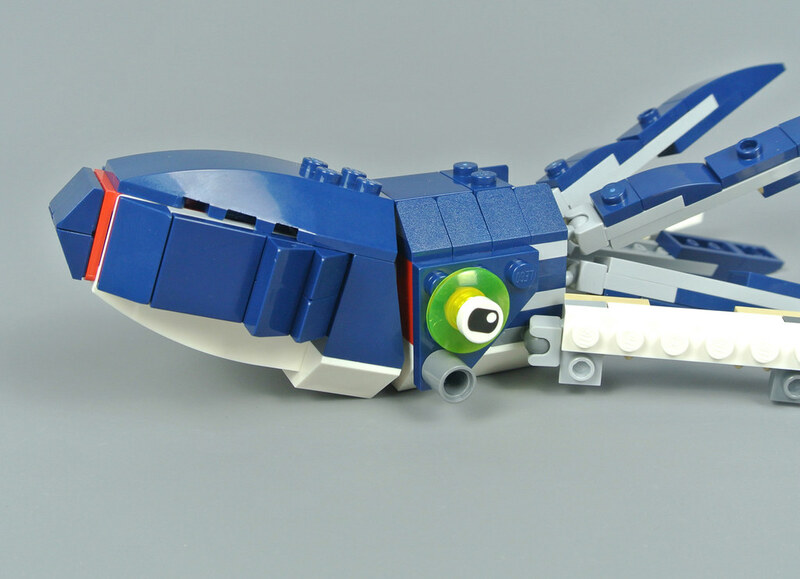 Once again, the larger fish makes extensive use of dark blue pieces and captures the shape of its source material quite accurately, featuring a large lower jaw and rows of jagged teeth. This model measures 14cm in length so is only slightly shorter than some real angler fish! Anglerfish are named for the fleshy lure, known as an illicium, which grows from their head. That detail is formed using a trans-neon green jewel but its red and light bluish grey colour scheme is inconsistent with the rest of the model, unfortunately. The jaws, on the other hand, look absolutely brilliant and I like the large eyes on the creature's head, despite real anglerfish featuring comparatively small eyes. Moreover, the light bluish grey ball joints that support the eyes are not perfect but such shortcomings are inevitable in Creator 3-in-1 sets. Layered 1x1 slopes and 1x2 slopes create a scaly texture across the back of the anglerfish and I love its angular fins. The tail is connected to a ball joint so it can move vertically and sideways motion is possible as well. A much smaller fish accompanies the angler fish. I like its red and dark blue colour scheme as well as the enormous eyes which can convey some expression. They seem rather strange in the image below but that is how they are attached in the instructions, perhaps representing panic as this minnow comes to realise that an angler fish is nearby! Instructions for the third alternative sea creature are only available online and this impressive whale is not shown on the packaging. That feels like a missed opportunity as the whale is certainly my favourite alternative model, although it is a pleasant surprise after opening the box! It measures 16cm from nose to tail and is presumably based upon a sperm whale given the relatively small size of the lower jaw. The head is constructed around 1x2x1 2/3 bricks with studs on the side and brackets, allowing you to attach curved slopes sideways and create a realistic shape. I like the small eyes which can be angled to generate some personality and the articulated jaw is excellent too. Furthermore, a 1x2 jumper plate represents a blowhole on top of the whale's head which looks great, although real sperm whales have an offset blowhole. Ball joints connect the head and the body section, providing lateral motion which works beautifully. The shaping is quite simple but it looks perfect and I like the articulated tail as well. Ideally, the model would be able to move up and down, thereby recreating the swimming techniques of an actual whale, but that may require larger ball joints to support the head as a single small joint would probably be insufficient. Another sea creature is also included and presumably represents a squid, giving the whale a sense of scale. The tentacles are individually articulated and two dark bluish grey ball joints form eyes on either side of the head. Many more pieces remain unused so you could easily build some other unusual sea creatures if you wish, without disassembling the whale. 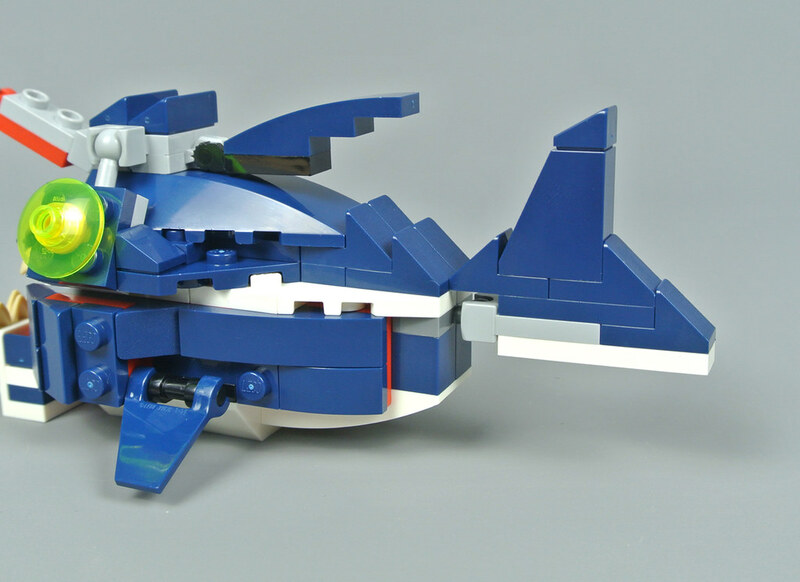 The shark occupies all 230 parts and is undoubtedly the most impressive model, as one would expect. It measures just over 21cm in length so is significantly larger than minifigure scale, although not to the extent that would preclude displaying them together. I love its dark blue and white colour scheme and the entire creature is divided into four sections which are linked by ball joints. This sideways motion is useful for display and looks realistic. Opening the shark's mouth reveals two rows of tan teeth. The pink pieces inside look fantastic and the trans-neon green eyes are quite intimidating! They are ingeniously constructed using Technic pins with a 4L bar through the centre and a small gap between the dark blue pieces represents nostrils on either side of the nose. In addition, the model includes several slopes that form gills behind the eyes. A narrower dorsal fin would have been ideal but I think its shape looks pretty good and the articulated fins on either side are splendid. Furthermore, I like the light bluish grey band which separates the dark blue and white elements. The gaps between different sections of the body are unfortunate but they are an inevitable result of including articulation. The model also features two pelvic fins which can move up and down while the tail swings sideways. Its narrow shape looks great but the colour scheme is somewhat muddled. The black 1x2 plate with a click hinge seems particularly out of place in my opinion. That component is available in white so could be replaced quite easily. 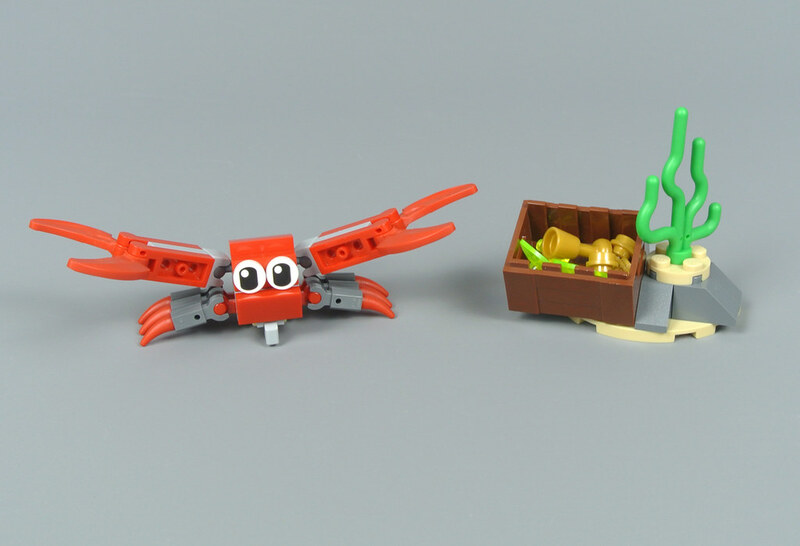 An adorable crab is also included alongside some treasure! This creature's exaggerated proportions are not entirely consistent with the shark but its large eyes look brilliant and the model is surprisingly articulated, featuring six legs and snapping claws. The accompanying terrain seems rather bland but provides a few additional pieces that can be used for the alternative models. Moreover, the alternative sea creatures are also quite appealing. 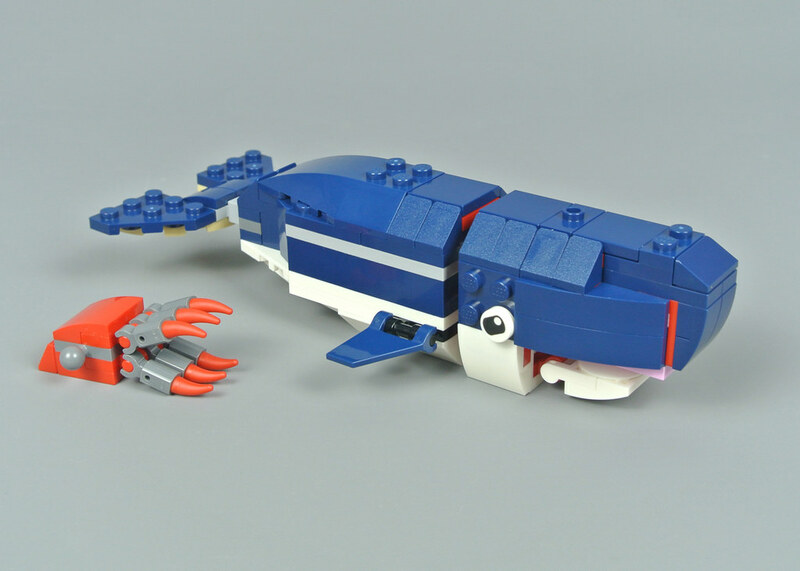 The whale could probably be sold as an independent set and I can imagine some people preferring that model which is testament to its high quality. This set costs £12.99 or $14.99 so offers exceptional value and I would absolutely recommend adding it to your collection. The whale is the best! That whale is freaking adorable. I agree that it’s a shame it’s not included in the hard copy instructions, but it’s nice that it’s actually a 4-in-1 model. The shark is superb - In the hands of my nippers it will end up with jet engines and a couple of lasers and probably be ridden by Lobo. Fun, colourful, cheap and 4 very distinct models. What's not to like? 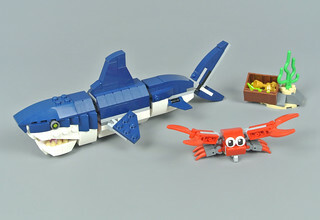 The models in this set that vastly improve over the last are the squid and the anglerfish. The squid in the old set had notoriously flimsy limbs, and while the anglerfish's teeth were comically large and not oriented quite correctly for an anglerfish, that wasn't bad compared to the illicium that just sat above its head rather than dangling forward. 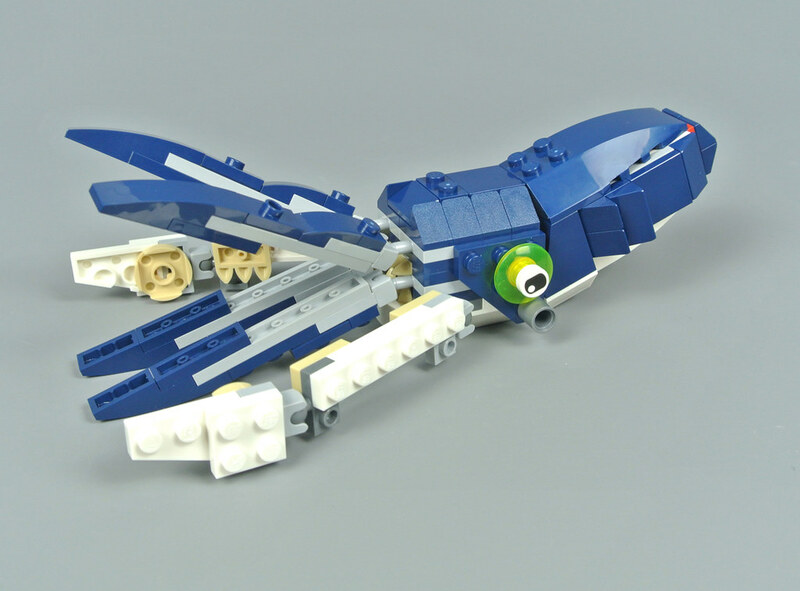 I did appreciate the brick-built eyes on the squid though. The printed eye used here is more fitting for an octopus, even if only slightly, since squid tend to have circular eyes and octopuses slit-like eyes. I'm not a fan of the shark in this one to be honest, I think the dark blue contrasts too strongly but I can't think of any other shade of blue (that's not sand blue) that would have been a better fit both for the shark and the other models. The lower jaw looks kind of weird and the pectoral fins are much too stubby. The only thing that this shark has over the last is that it has more blue than grey. All the side builds that come with each model are great. While it's a shame that there are no glow-in-the-dark elements here, the trans-neon green is an adequate replacement since that one does glow under UV light. If I had to pick a favorite model among the 4 (including the whale), it'd be the squid. It's a shame considering sharks and cephalopods happen to be two of my most favorite marine species, and my partiality to the latter means an alternative model has beaten out the main model this time. 4. skipping this set altogether. I got 4506 for my 13th birthday, and I turned 27 just over a week ago. I've already used my birthday money this year on #70825-1 Queen Watevra's Build Whatever Box! (which I expect to get many, many hours of play out of), though, so if I do get this, it'll have to wait. More time for me to consider all my options. By the way, thanks for the reviews you and Huw have done over the last few days for FORMA and this set. It's been quite the ride for me, as I'm sure you can tell from my comments. 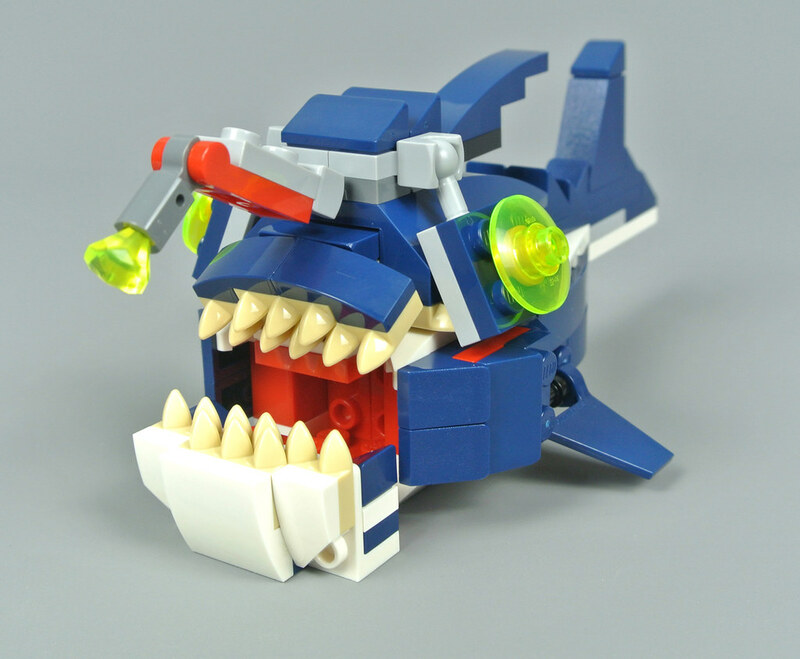 When I first saw images of this set I thought the shark's eye was a new printed 1x1 round tile. The fact that it was brick built all along and fooled me is pretty cool. The 4th build (whale) was a nice surprise to me. I wasn't aware of it before. The shark’s eyes are peering into my soul... ack! It creeps me out. I totally like this better than the Forma shark though. @CapnRex101 great review, appreciate that you included all alternative builds in it. Definitely picking this one up! It's so strange that the best model imo (the whale) is the last (least important) alternate model. 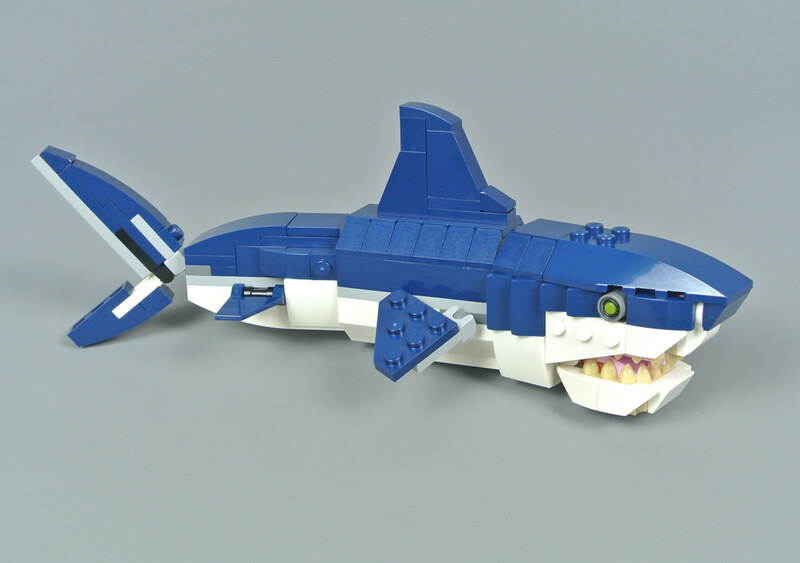 The shark could easily be a megalodon, which could explain why it is much bigger than minifigure scale. Unless it's been nibbled on, all squid should have eight arms and two tentacles. And if the whale is supposed to be a sperm whale, that mini-squid is _definitely_ there for it to nibble on. The "minnow" with the angler fish may be loosely inspired by Blenny, the nervous fish that Anchor brings to the shark meeting. During the end credits, the angler fish and Blenny bump into each other with memorable results. Coloration depends on the shark. The Forma shark is probably based on a Great White, which is not only one of the best known shark species, but matches that coloration (and the females tend to be pretty bulky, like the model). The Blue Shark, as implied by the name, does tend to be rather dark blue on top. 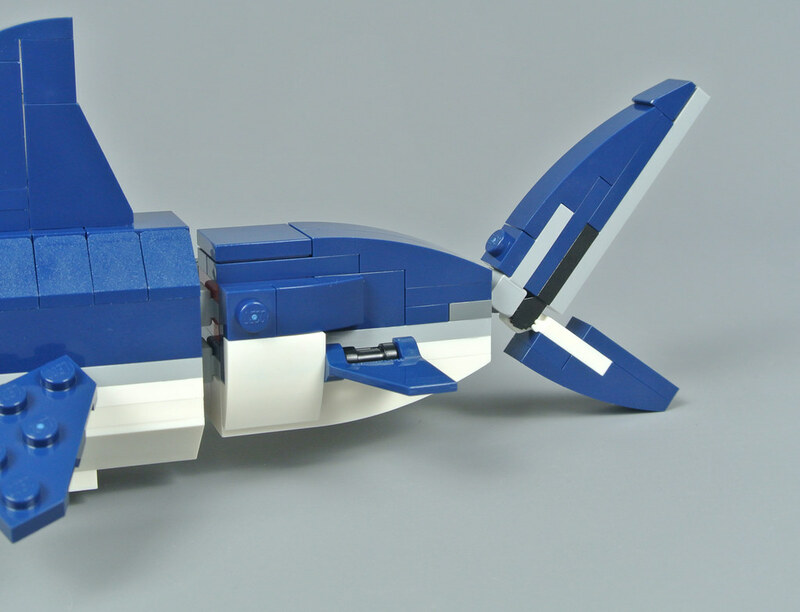 This coloration works very well for a Blue Shark, though the structure is all wrong. Blue Sharks are extremely slender with very long noses, and equally long pectoral fins. This body might be more representative of a shortfin mako, which coincidentally also happens to have a metallic blue dorsal color. Wow, TBH that’s the exact same thing that I thought - I was thinking, “Oh cool, that will be a very useful new printed tile for MOCS!” That’s an impressive brick-built technique! I love when TLG uses pieces in cool ways. I really love this set so much...as I do most Creator 3-in-1 animal sets. While I really like all the models, I just wonder, why they included the squid, as one of the alternatives and not the whale...I do like the whale a little more. This is the most-anticipated 2019 set for our family. It’s finally at home waiting for a free time to build. Thanks for a great review! I looked at this one before but now I may actualy get it. The whale should've been one of the 3 main models. Definitely better than the other two alt models. Nice set on the whole though, high quality builds all around. Great review, and you've tempted me to add this to my wishlist. 2019 purchases now up to two sets. Another reason why the creator range is the best! Just bought this yesterday, and I'm so glad I did. One of the best value sets I've ever bought, with a superb main build that's detailed yet sturdy, and two great alternate builds (along with the whale, which was a lovely surprise and looks fantastic.) Learned a new building technique with the shark's eyes, too. Not only is it a superb model but it makes a brilliant parts pack, with lots of dark blue pieces, SNOT elements, and mixels-style joints. 230 pieces for just £12.99 is a steal, especially when they're as useful as the ones in this set. I also picked up 31090 Underwater Robot at the same time, which I haven't built yet but I think should complement 31088 Deep Sea Creatures really nicely. They both make me really nostalgic for the Aqua Raiders theme - I think we're due for another line of underwater sets soon, given how long ago Atlantis was. IIt's amazing how good those balljoint mounted side eyes look! It was a day one buy! And I hope to get some more on sale! WAIT. 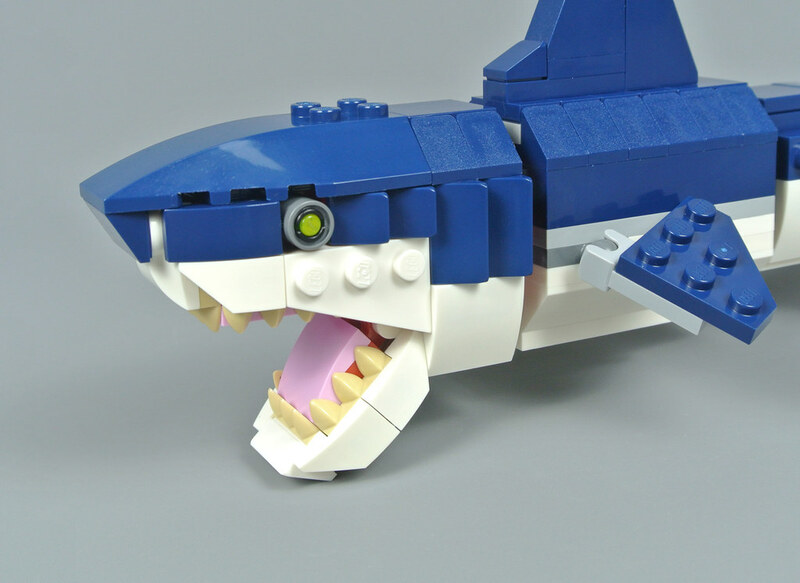 I THOUGHT SHARK EYE IS A NEW PRINT, and it's BRICKBUILD! WOAH. Definately one of the top sets of this year. That whale is simply amazing! And those shark eyes nails it. Creds to the designers behind this set. Talk about burying the lead. The whale is the best model there! Yes, I totally agree. It looks like an excellent model/models, awesome for display/play, great pieces, and techniques, and and on top of all that, an exceptionally good price to part ratio. One of the best I’ve seen since for quite a while, TBH. Yes, I agree with you 100%. Creator 3-in-1 is doubtless one of my favorite LEGO themes. They seem to offer the best value for money, build options, and and are also usually, TBH a lot more creative than some of the newer sets with huge preformed pieces. The 2019 Creator sets so far, are looking really excellent, at least to me personally. Even though they all look great to me, this set and the Riverside Houseboat really stand out to me. I was thinking about getting this set before I read this review, but now I really feel like getting it! Seriously that whale is awesome! 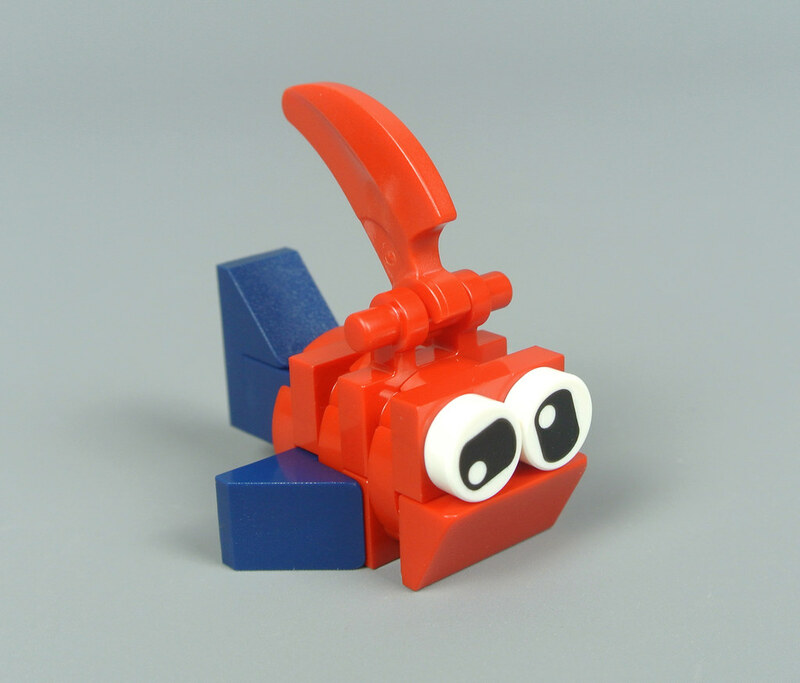 Also I have plans to get the parts needed to build a second crab, which will go great with Sonic The Hedgehog! For those who may be new to the trick used on the shark eyes, it only works with a few Technic pins. Without checking, I know for sure that the 2L friction pin and the half-pin allow a bar to pass all the way through. I believe the 3/4 pin does as well. The 2L frictionless pin will fit a bar from both ends, but has a narrow point in the center that prevents them from passing through. I believe the 3L frictionless pin has tapered holes, so while you can fit a bar as deep as the notch without any problem, after that it jams up. The 3L friction pin has rectangular holes on both ends, so even that much is impossible. And of course none of the axle-pins will allow a bar to pass completely through, but I can't remember offhand which of the four can at least accommodate a bar for the full length of the pin. I did something similar about 6-7 years ago when I designed the eyes for my Pixar Cars cars, but it looks completely different. I put a white headlight brick in front of 2x 1x1 Technic bricks, put a 2L friction pin in the Technic bricks, fed a 3L black bar through all three bricks, and this resulted in a black pupil in a white eye where you can't even see the Technic pin. Then I put 1x1 round tiles in different transparent colors on the stud to add the colored iris. That was the easy part. What took me a month to figure out was how to tilt the whole thing back at an angle that matches the 2x6x2 windshield. Anyways, I'm sure I wasn't the first person to come up with that trick, especially if you consider how many ways it can be used for things that aren't eyes. A 4th build? Awesome! I wasn't aware of that. Do the other Creator 3 in 1 sets just released also have a 4th build? I like that Anglerfish. Looks like it was a good choice to do. Thought about buying it too as it looks pretty cool. The Shark and Squid are nice as well. Yeah, it's really hard to pinpoint which species it's modeled after, if any. I had not heard of the shortfin mako shark, that's probably the closest one I can relate this model to. Still looks a little off to me with that lower jaw, though. I know sperm whales feed on giant squid, perhaps explaining its inclusion with that alternate build. Love these kinds of sets. Especially when they are as well done as this one. Might get three to build all three versions at the same time. Should've included a bowl of petunias with that sperm whale. 4th build is a nice surprise. I must say I'm really impressed at how the same parts were used so well for so many distinctive animals. Yes, there are limitations (mentioned in the review), but overall wow (for the review) and wow (for the set). I honestly have to say this is one great set, the whale looks amazing! 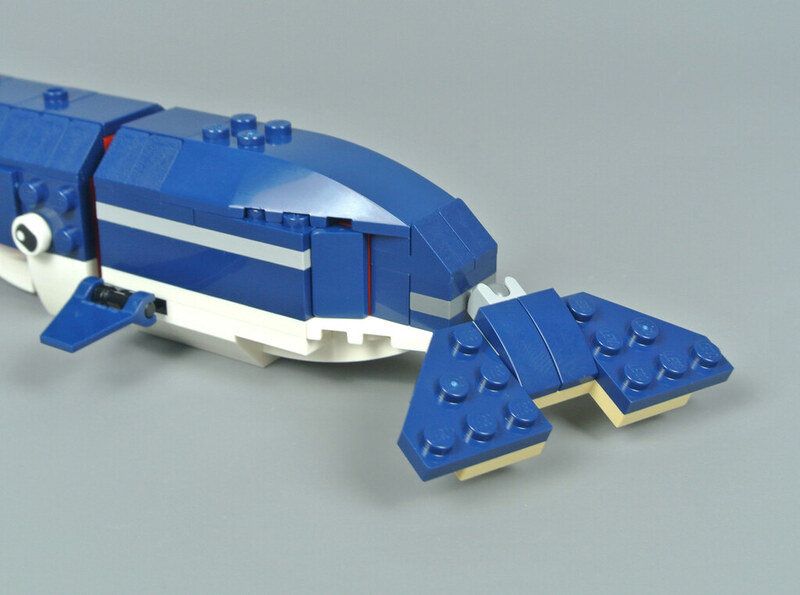 An informative review of an excellent set, especially with the whale. Now I might purchase two of the sets just to display both the crab with shark, and the little squid with whale, or even the minnow with anglerfish with the crab and shark builds. Appreciate your reminder that all squid species "have eight arms and two tentacles." 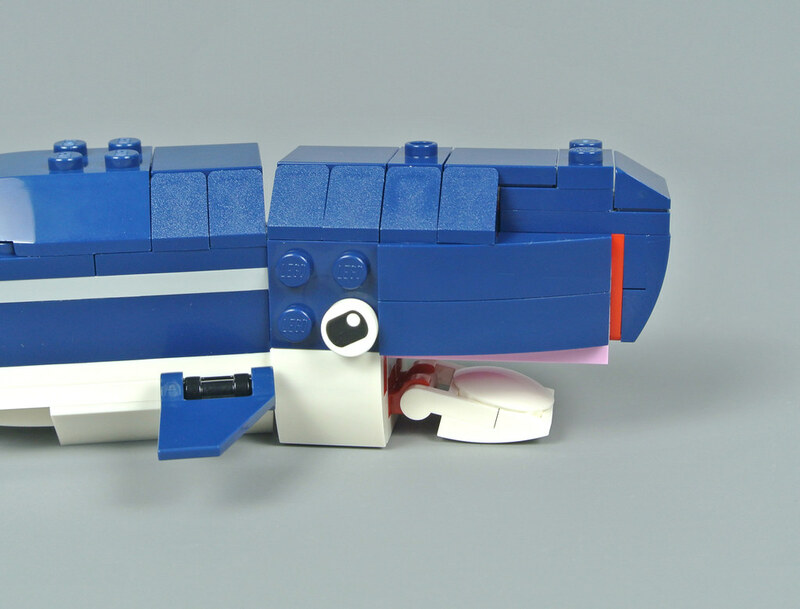 Therefore, would prefer the whale as the more accurate, as well as more delightful alternate build. 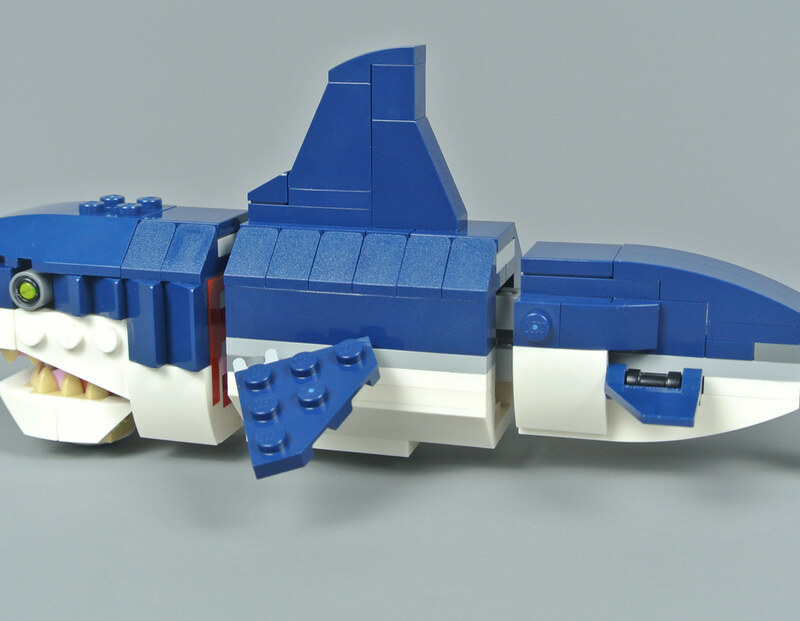 If the whale is not too small nor overwhelming to minifig scale, then it'd be an excellent display with the 60153 People Pack - Fun at the Beach, or perhaps even with the City 60221: Diving Yacht. Oh, I doubt it's actually based on any specific shark, for a basic Creator set. If they were doing something a bit more high-end, I could see them investing the time and resources to do some in-depth research, but not for this. The point was just that sharks can be blue, though shades of grey and brown tend to be the most common colors. That I'm aware of, they can also be pink-ish white (the goblin shark) and yellow (yellowish brown, really, with the lemon shark). I'm not sure if black is ever the dominant dorsal color, but the black-tipped reef shark does have bits of black on the tips of the fins and tail. There's always something new to learn. I'd never known that sperm whales had off-center blowholes before. Had to look it up afterwards, and while it's really hard to tell in most pictures, I did find a few where you get a clear look, and it's really bizarre looking. Then again, I just read about a squid that starts out with two matched eyes, but as it grows into adulthood one eye grows really huge and turns yellow while the other stays unchanged. They knew this squid always grows like this, but nobody knew why (at least with flounders it's pretty obvious just from observing them why they flip sideways). Someone finally got curious enough to figure it out, and the reason appears to be that it helps defeat countershading. Most fish and sea mammals tend to be dark up top and lighter below so they blend in with the darkness of the depths or the sea floor when seen from above, or the brighter water when seen from below (some fish even have bellies that glow so they don't just appear as a dark silhouette). This squid sits in the water column tipped so that the small eye looks below and the large eye looks above, and the size and color of the large eye helps it spot things above it that would blend in when seen with the regular eye. But for keeping watch for predators below it, the large eye doesn't present any advantage, so the other eye remains unchanged. BTW, all whales start out small(ish). So even if it's not large enough to represent an adult sperm whale, it could work for a juvenile. I don't tell my wife what sets I want to get until both of us have looked through the newest catalog. But I liked this when I saw it (and noted its similarity to the 2004 set, as well) and thought it would go well with the Deep Sea Explorers set. It would also represent the first 3-in-1 Creator creature set I own. My wife loved this so much she went to Lego.com and put it in the cart without even asking if I wanted it. It's the first 2019 set we purchased. So I think this set will be a hit. 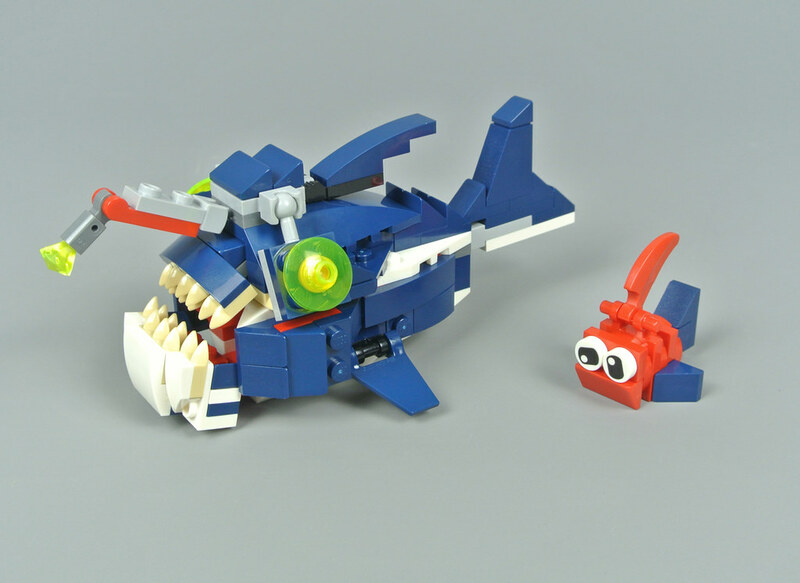 The whale and the shark are excellent, but the anglerfish feels like it should have been the online-only build, as the whale is much better.